Citizens of Yerevan and its guests witnessed the most large-scale celebration ever today. Hardly anyone can recall any event that was celebrated with such wide scope. It wasn't an anniversary and in fact, last year's 2790th celebrations were in no comparison with this year's. Rumors say that it was organized this way because it was the first Yerevan Day celebration for the newly elected head of City Municipality, and plus, some really big distraction for people was needed after the fuss of signing the protocols for normalizing Armenian-Turkish reactions on October 10. Interesting to mention that the ribbons, pins and other symbols of celebration had October 10 writing on them. The traffic in all the downtown was completely stopped for the whole day. We had a rare chance to see Mashtots, Sayat-Nova avenues, Abovyan, Khanjyan streets so empty! Abovyan street. View from the crossroad with Sayat Nova ave.
Windsurfing demonstrative contest on the Swan lake. Retro automobiles show at Cascade Complex. Shooting of a film about Yerevan at the statue of "Tghamardik" (Men) near Saryan statue. Only Northern Avenue held 5 stages which were "occupied" by various kids' singing or dancing ensembles. As you can see the scale is really impressive and the organization was rather good than bad. All of the major organizing companies were involved and hundreds of volunteers were coordinated. I only got disappointed when realized that being there at the heart of celebrations at 4 in the afternoon, I couldn't get any flag or pin or balloons :( because they were all distributed. By the way, many information centers were organized on various locations that were distributing flyers and agenda and also the symbols. Trust me, I have NEVER EVER seen the city so crowded before !!!!!!!!!!!!!!! Seemed like there were hundreds of thousands people in the streets. They were all happy, shining and content. I was enjoying watching faces of the people passing by from the windows of several cafes in downtown, meanwhile being able to do some stuff for job (long-live free wi-fi) and also to upload the photos I took by that time. I'm so positive and happy now. In fact, I would die if, for some reason like being abroad, I wouldn't be able to see and feel all this. I'm so not programmed to live abroad for a relatively long period. I can't miss my city and my people to see festive and really happy! So.. Enjoy the pics :) and let me go to collapse on my bed… I was on feet the whole day! I wish i was there tooo...!!! 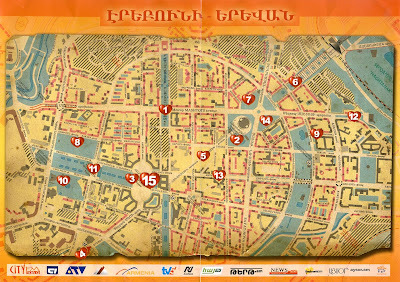 i was missing Yerevan the whole day yesterday.. up to now.. and always.. I see you really enjoyed it! The woman cleaning her shoes with hands is killing me on IMG_1626. Sorry, but where is the English Park??????????? Thanks for a very interesting post! My latest obsession.. Parisian macarons!